As our crew of five closed in on the mooring it was a great time to reflect on what we had just experienced. It had been tough race and we had abandoned on the first night. That said it was an experience that I would not regret. What if I sailed all my life and never go though a 40 mile a hour wind or experience a 10 to 20 foot swell or even a storm? Looking at my crew-mates and knowing that my life and theirs depended on the skills that we demonstrated as yachtsmen. Returning to port, we sat in the cockpit and recalled surfing down waves at 10 knots, and how I was shouting out that this was sailing at its best, Oh boy did I have a great big smile on my face! The skipper smiled at me as if to say he's nuts (the verdict may be still out on that one). We arrived at the mooring field, dropped the sails and tried to start the engine. The water we had taken on offshore had found its way down to the engine so it took a while to get going. "That's Seafeather heading back towards home . . . [muffled] . . . should we poll the . . . [muffled] . . ." Through the whistle of the 30 knot winds, that is what I heard about 2.5 hours after the start of the 2009 Around Long Island Race. I was on the rail, taking a beating with the rest of our crew in 7 foot waves. I was wet, soaked through my foulies and starting to get cold, and I'd be lying if I said my stomach was fine. So when I heard those words I was, frankly, relieved. From the beginning things were hairy. We fried a battery during the load, and one of our crewmembers got stuck in traffic so we were late leaving the dock. We got pounded progressively worse as we approached the start and we had reports that the weather was going to build all night. When we went to set the main, I slipped on the cabin top and lost the main halyard. That was close to a showstopper because I don't think they would have sent me up the mast in those conditions, but luckily we were able to head into the wind and get the halyard to blow back on to the deck. And yes, I felt like an idiot. With our late departure, we thought we had missed the start, and considered turning around so that we didn't waste two days sailing for nothing. But I guess we figured we had come as far as we had so we might as well find the starting line. All starts had been delayed, so we were OK, but as we checked in by radio our gun went off, so we were several minutes late, but still in the race. A first hand account from Around Long Island Race 2009 - "Why, oh Why?" The first time I saw the boat, my first response was why am I going offshore in a boat that looks like it won't make it around the corner let alone make it around long island (why)? Why am I in an all new crew with a person who has raced the ALR six times (why)? Why is there a rookie dressed in shorts and tee shirt in a rainy weather and who has never left the bay? Well we headed for start and the weather went from worse to worse real fast. We were about 3 hours early for the start in six foot swells (why again? ).The rookie got sick and cold before the start (why). Why didn't he dress for the weather and take his motion sickness tablets? No one told him. If anyone has any accounts from the race, I would love to hear about them and will most definitely share. Last year, I took part in the 190 mile, 2008 Around Long Island Race. The course starts off Rockaway Point, NY, you then leave Montauk Point and the Orient Point Lighthouse to port, to the finish line off the Glen Cove Breakwater. The 2009 Around Long Island Regatta was started yesterday afternoon in some of the worst conditions in the event's history. Just got back from a great few days sailing, racing on Knot Again in the 2008 Around Long Island race. The race itself started very well for Knot Again but sadly did not finish as well. In fact, we were one of 15 who DNF’d. Howard had put together a superb crew. Howard, Knot Again’s owner/skipper has won many prizes in the race in prior years. In fact his wife Skippy is quite relieved at not having any silverware to polish this year. Our crew-mates were Tim, an experienced racer and cruiser and all-round good egg; George, a hilarious Episcopal priest who curses like a trooper (I hope God's not reading my blog, George)- George has sailed since the age of 7; Colin, my watch-mate with a wicked sense of humor and someone I would definitely call an all-round good bloke. Colin had raced the ALIR many times before as well as a Marion-Bermuda in a 32’er; Bruce an utterly unflappable and experienced cruiser who you would want to be around in a crisis; and yours truly - Every boat has to have one person dragging the rest down. A better bunch of guys I could not have hoped to sail with. We had many laughs and everyone knew their business on board. There were 57 boats entered in 7 divisions. 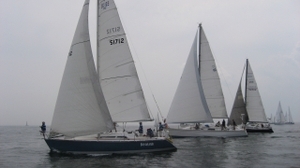 We were in A Class of 12 non-spinnaker monohulls. Knot Again is a 35’ C&C and our PHRF rating was somewhere at the high end of the pack but there some boats we would owe half a day to. We had high expectations. Howard and Knot Again had won his Division in the 2007 race. This year, the fleets had been changed around and the odds were definitely tougher but we up for the challenge. The race starts at the Southeastern tip of Long Island, about 3 miles South of Rockaway. We would then head 90 miles Northeasth’ish towards Montauk, hang a left, head 20 miles Northwest through Plum Gut, turn left again and head back Southwest, 80 miles to the finish at Glen Cove by the Sea Cliff Yacht Club, the race organizers. The race started promptly at 1300 on Thursday and we crossed the line first, winning the EGAD award for being first across the line. Egads we won something! Our strategy was to go six miles offshore and hold this line until Montauk. Howard and I had both consulted sailflow.com. I had even gone as far as printing wind charts for the whole race at 0630 the morning of the race. In retrospect we would have been better served had I slept in and not brought these. The winds were consistently 5 miles lighter than sailflow estimated and the holes were not where they were predicted to be. I am not blaming sailflow, we made our own decisions and the wind is a fickle friend. Thursday went well. The fleet split in three. About half the boats stayed inshore. The rest divided between taking the same course as ours, 6-10 miles offshore and a few headed Southeast over the horizon in search of bigger winds far offshore. For most of the day we had 5-8 kts of winds, we seemed to be overtaking boats in our class close to shore and keeping pace with the onshore spinnaker boats. Things were looking good. At 1900ish we had a superb lasagna, a little red wine and split into 3 two hour watches. I took the 0100-0300 watch with Colin. By then the winds had lightened below 5. Next morning we were still in a good position. The prediction was that the stronger winds would move offshore so we headed out another 4 miles. Bad move. Where we expected winds, we found a life-sucking hole that was supposed to be somewhere else and we couldn’t escape the bloody thing. It was so frustrating. We had made the first 60 miles in under 12 hours but took 18 hours to make the remaining 30 miles to Montauk. For 8 hours on Friday we made 4 miles! Worse than that the inshore boats were clearly going faster and were out of sight by Friday afternoon. 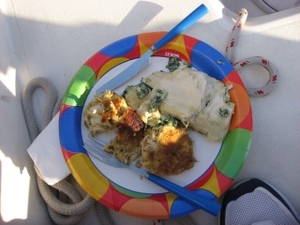 At 1800’ish we had down one of the best meals I have eaten on a boat: Crab cakes and spinach pie washed down with a delicious Long Island white wine. I love the way Howard rolls! At 1900 on the nail, we rounded Montauk Point and turned Northwest on a port tack. The 20 mile reach across the Northern end of Long Island was one of the beautiful sails I can remember . Puffy I gave a you a wave as we went by. We had 10-12 kts of wind, the boat was doing her maximum hull speed plus one kt for the flooding tide. The skies were blue, the shoreline stunning. George and I sat on the rail and put the world to rights. As the sun went down, the sky was purple. One of the most spectacular sunsets I have ever seen. Knot Again, made the 20 miles to Plum Gut in 2 ½ hours and we transited into Long Island Sound in great conditions. The mood on the boat was positive. 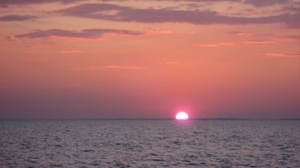 Howard had been at the back of the fleet and won t his race in the dark in Long Island Sound in past years. We were up for it. Sadly the wind and tide had other ideas. We made some progress into the night but the wind died in the early morning. When Colin and I went on watch at 1 am, the boat was sailing backwards. To make matters worse we were backing towards a mid-channel marker that had a gravitational pull like a tractor beam. With some guidance from Howard, we got her moving ahead again and by the end of our watch we had made one mile. That’s one mile backwards and two miles forward in 2 hours. I woke up at 0700 for our next watch and we were barely any further than when I went to bed. At 0900, Howard called the crew together to discuss our situation. If we kept going at this rate we would be lucky to cross the line by noon on Sunday. As we then had to wait for the right conditions to transit Hell Gate, we would be lucky to get back to Raritan by 0400 on Monday. Not an option for any of us. We agreed to wait for another hour or two to see if the wind would pick-up. If no change we would abandon the race. Sadly no change. 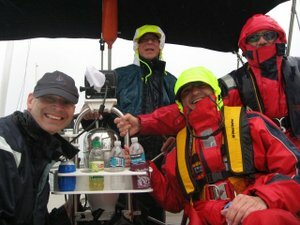 At 1030 on Saturday we turned the engine on, dropped sails and headed to Glen Cove as a DNF. We made it Glen Cove by 1900, picked up a mooring ball, showered at Sea Cliff Yach t Club, had a few beers then commiserated (actually we were in good spirits) over another outstanding dinner by Howard – Tilapia, pasta and a number of good wines. Damn Howard, you have style! One consolation - one of our Club mates, Seafeather, won her class. The next day we motored home, up the East River, into New York Harbor under the Verrazano Bridge and back to Perth Amboy. Sunday was beautiful and of course the winds were much more stronger. I took a ton of pictures of this spectacular cruise and I will post them soon. Knot Again beats the Circle Line any day. I am off tomorrow on the Around Long Island Race. I have done a fair bit of racing round the cans and did Round the Isle of Wight a few years ago but this is my first Around Long Island Race. The race leaves from the southwestern tip of Long Island, off Breezy Point in Brooklyn and finishes at Glen Cove on the Northwestern part of Long Island. After the finish we make our way back through Hell's Gate, past Manhattan and back through NY Harbor. It will be a lot of firsts for me. First offshore race over several days, longest passage at sea, first time sleeping at sea under sail, first time doing a night-watch. I can't bloody wait! I will be sailing on Knot Again so if you see us go by, give us a wave! We are renaming our new boat. She is currently known known as Tiger Lily. We will be renaming her Messing about. Howard, the skipper of Knot Again, the boat I crew on, told me to take great care with this. Renaming a boat is a superstitious thing and there is a ceremony to observe that needs to be taken very seriously. It is a very complicated ceremony that can be found in full here. If you are unfamiliar with it, check it out, it's bizarre. Howard recounted his own tale of woe to me of the perils of not observing the ceremony with the appropriate decorum. Howard's 35' C&C had two previous owners. The original owner named her Ariadne. The owner before Howard named her Persephone. A nice sounding name but why would you name a boat after the bride of Hades and queen of the underworld? Howard being a master of the pun renamed her Knot Again. Being a scientist by training, Howard disregarded the superstition and did not perform the boat renaming ceremony. 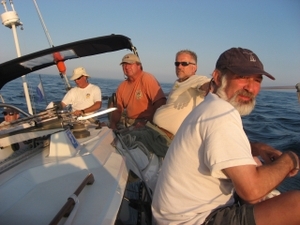 Howard was racing the newly named Knot Again in the Around Long Island Race. They were over half way into the 200 mile race and about to round the corner to pass through Plum Gut. This is a notoriously tricky cut. If the tide is against you, you are screwed. It also has some very nasty submerged spires on its Eastern edge. Howard was off-watch and sleeping below. His son was at the helm. As they approached Plum Gut, there was one other boat ahead of them, a longer and faster boat. Knot Again was at the Eastern edge of the Gut and close to the submerged spires. She was clearly sailing faster than the other boat and would pass through first. In a fit of competitive pique, the other boat started luffing up on Knot Again in an effort to overtake her. She forced Knot Again closer to the Eastern edge of the channel. Clearly she wasn't letting the upstart from Raritan upstage her. This was disastrous. With an almighty bang, Knot Again's 7ft keel struck the spires. To Howard below, it was like being in a car wreck. The boat stopped dead. Howard immediately drilled open the cabin sole to inspect the damage. His worst fears came true. The impact had knocked the keel backwards and water was gushing in. The crew bailed like crazy to keep her afloat. They managed to get Knot Again to Greenport, an hour away, where she was immediately hauled out. Repairing the damage cost $20,000. 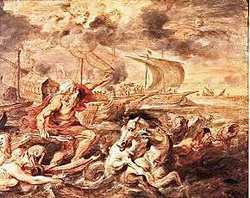 The name of the boat who forced Knot Again formerly-known as Persephone? Cerberus! Yes, the dog of Hades that guards the gates of the underworld tracked Howard down and got its revenge on Howard for daring to eradicate the name of its queen without conducting the proper ceremony. I have to admit that I am getting pretty nervous about the renaming. PS: Not surprisingly, Howard protested against Cerberus a day later. His protest was denied because he had not flown a protest flag immediately after the incident. What was Howard thinking? PS 2: Another bizarre coincidence was that one of Howard's crew had a daughter called Ariadne, the boat's original name. PS3: The owner of Tiger Lily was also on board. Oh, crap, I am scared! My wife and I recently had dinner with some sailing friends who own a Feeling 36, made by Kirie in France. A really beautiful boat that they cruise out of New Jersey. They used to race her and the skipper, Ted, is a veteran of several Round The Island races (The Long one next to the Big Apple that is not the small one southwest of Pompey). It's a 2-3 day race involving offshore racing in the Atlantic, some tricky currents and long reach back down Long Island Sound (here is a map). Over dinner, he told us a great story from one of his Round the Island adventures. For this race, he had lined up a 8 other crew including 4-5 guys who could helm. Unfortunately 2 of the more experienced crew were no-shows so they started the race with skipper + 6. The initial sailing down the south side of LI was rough going and the 2 other guys who could helm got very seasick so it was left to Ted to stay permanently at the helm. The wind died to 2-3 knots toward the end of day 1and the whole fleet slowed to a crawl. Ted being a canny man of the salt figured that he could do some catching up on the bigger boats in the light airs. The crafty bugger put his spinnaker out on the leeward side making it into a giant Genoa. It worked a charm and by the time they had reached the tip of Long Island, they had overhauled most of the fleet. They made "Plum Gut" (the short channel between the North Fork and Plum Island) in time to catch the height of a 6 kt current that took them and 4 other boats into Long island Sound. The winds were still very very light. In fact so light, that at one point going through Plum Gut, Ted's boat was going sideways at the same speed as the other 4 boats were going forward. The current was actually the only thing keeping the boat moving and the sails full. As they turned West into the Sound, fog set in. Great! By this time, Ted has been at the helm for 36 hours and the race was fast losing its allure. Through the fog, Ted could make out another boat on an opposing tack coming towards them. As Ted was on a starboard tack he called rights but the guy didn't let off and came slowly across him and then disappeared into the fog. Ted had had enough and told one of the other guys to take the helm for a couple of hours while he got some sleep. About an hour and half later, one of the crew shook him awake with a look of panic on his face. According to the depth-meter they were shoaling fast. This made no sense. Ted had set them on a course up the middle of the Sound in 300 ft of water. It was still foggy so he couldn't tell by looking around what was going on but a quick check of the GPS showed them to be 10 miles East of the position they had been when he went to sleep and we're about to run aground. East?!! What the ... They were supposed to be about 20 miles west of their current position. It suddenly all dawned on Ted. As they entered the sound, the current was running 6kts east. With almost no wind, they had been going backwards and East for two hours. Ted realized that the boat that had crossed his bow without giving way was in fact anchored. They had drifted backward behind him but he couldn't tell in the fog. They bit the bullet, turned on the engine and quit the race. The moral of the story is get some sleep and make the puking buggers tough it out at the helm earlier.